GREEN BAY — Peyton Manning’s numbers aren’t up to his usual standards, but he’s the quarterback of a 6-0 football team and his coach praised his leadership. “He’s a tremendous leader. He’s all in and working his tail off,” Broncos Coach Gary Kubiak said of his quarterback, who squares off against Aaron Rodgers and the Packers on Sunday night in a game of unbeatens. Manning has thrown for 1,524 yards, seven touchdowns, 10 interceptions and a 72.5 passer rating this season. He spoke to Packers media on Wednesday about the toll his neck surgeries have taken on him, but he also spoke of his desire to play on. “I feel fortunate to still be playing, I don’t take it for granted and I still enjoy it,” he said. It’s the Denver defense that’s stolen the show this season. It’s currently ranked No. 1 overall, with the No. 4 run defense and the No. 1 pass defense. Kubiak cited the pass defense as the key to the Broncos’ success on defense. “We’ve made a lot of big plays. We have a back end that does a great job of not only picking the ball but making big returns when we do pick it. 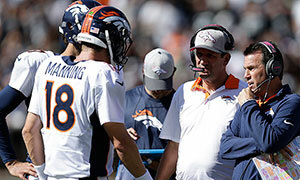 We’re playing hard and we have a lot of people chipping in,” Kubiak said. Aqib Talib has scored two touchdowns on interception returns and fellow cornerback Chris Harris has scored one.